The wheels can be mounted on one of two mandrels. The larger mandrel is 25mm (1in) diameter with a 18mm (23/32in) spigot at one end. I was able to grip the 25mm shaft in my chuck jaws. 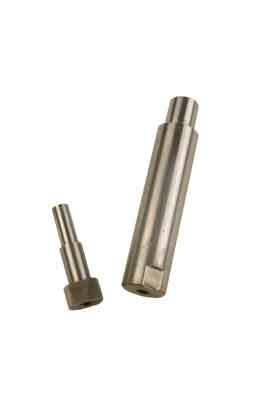 The smaller mandrel has a 10mm (3/8in) spigot for use in a Jacobs/drill chuck. 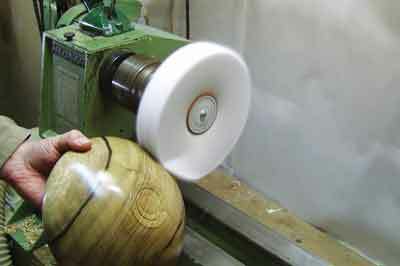 This mounting method allows polishing with a drill while the piece is still mounted on the lathe. Each wheel has a threaded bolt at the centre for easy mounting and changing on the mandrel. Instructions remind you that finishes must be thoroughly dry before buffing. I have tried to buff lacquer finish too soon and found it has a tendency to 'drag' if it isn't fully cured. Another feature of these buffing wheels is your ability to adjust the 'hardness' of the wheel by changing the speed of rotation. If the speed is reduced, the wheel is able to deflect more to conform to the shape being buffed. I made some tea-light holders which I sanded to 400 grit and coated with sanding sealer. With the first buffing wheel, I loaded the Tripoli compound and buffed one of the pieces of yew and one of the pieces of oak. Both ended up with the surface looking smooth and all the brush marks from application of the sanding sealer had gone. There was some evidence of the Tripoli compound being left in the pores on the oak which was not unexpected as the instructions advise against using the Tripoli on open-grained timbers. I also tried buffing another pair of tea- light holders using the white diamond as the first buffing stage. Compared to the first two pieces - which were buffed with Tripoli and white diamond - it seemed to take longer to buff them both, but as the white diamond compound is finer than the Tripoli, this isn't unexpected. For a harder wearing finish than conventional paste wax, buffing systems like the Chestnut kit are a useful addition to any turner's toolbox. 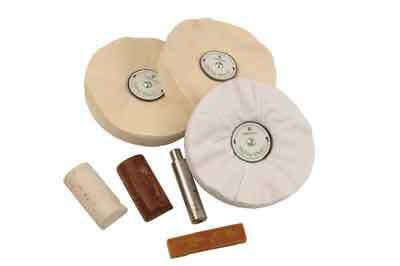 I understand that Chestnut will soon be offering a set of 100mm (4in) buffing mops for bowl interiors. Having put the Chestnut buffing system to work for the last two months, it is now my preferred system. It is quick and easy to assemble and use. It not only gives a consistent high quality finish to all the varied woods and alternatives that I have buffed and polished using the system, but it does so with ease and is very competitively priced.